If you are interested in an amazing tea experience, consider taking our private Iran tea tour and tea tasting. We will take you out on a guided walk in our tea fields located in Lahijan that is one of the most important cities of Iran’s northern Gilan province with regard tea farming to taste our teas. On a guided walk in our tea fields, you will really see the tea plants, soil, insects and weeds that are different in a stable ecosystem. We share our learning and appreciation of farming and rural lifestyle through tasting of tea and private farm tour. We hope you will take time to find deeper connection with nature and an appreciation for the way of tea. Join our Tea tasting tour in Iran and enjoy a memorable trip. This morning we take you north of Iran to visit Rasht. On our way to Rasht city we will have short stop in Rudbar. Its name (meaning “by the river” in Persian) is a reference to the river named Sepid Rood that passes by the town. Rudbar is also called “Roodbar Zeitoun (olive)” for the olive gardens in the area. Rudbar’s local economy notably includes olives and olive–based products. Groves of olive trees surround the city. Olive oil is produced locally. Rudbar is also known for its cream–hued, handcrafted carpets of fine quality. Despite the olive gardens that may suggest presence of a Mediterranean climate, the winters are very cold in the area. The winds in the Sepid Rood valley (Manjil) are well known in the country. Here we will try an amazing local food named Zeytoon Parvardeh (Persian Pomegranate, Olive, & Walnut Dip). Leaving Rudbar behind we continue to visit Gilan rural heritage museum to see real life style and culture of Gilan which are collected in this place. It is one of the most fantastic and attractive place in Gilan. Then we go to city center to have a special sea food from Caspian Sea like the Persian Caviar, Mirza Ghasemi (A Persian Eggplant), Morgh–e Torsh (Sour Chicken Stew) or wonderful Baghala Ghatogh (Lima Beans with Eggs and Dill). Then we will visit the Rasht market and local fish market of Rasht. Prepare your camera! This market includes fresh fishes, local vegetables and fruits, and other Food produced by local people. Tonight we well walk in Rasht pedestrian around the old Town Hall. 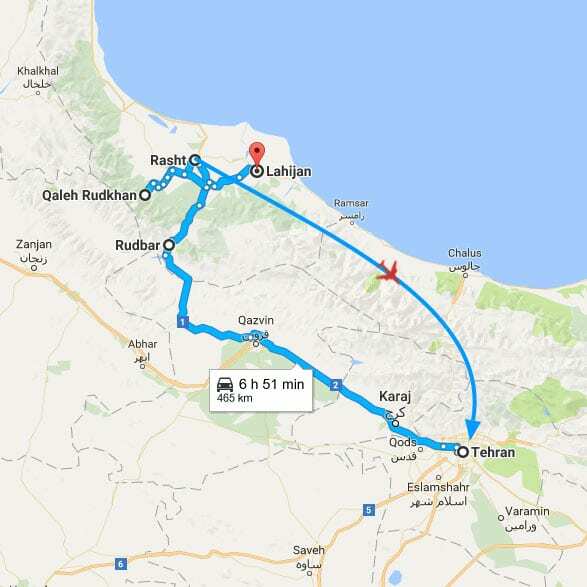 Today we move to Lajijan. Lahijan is one of the most important cities of Iran’s northern Gilan province with regard to tourism and agriculture. The city, which reflects an Iranian-European architectural blend, is located on the southern slope of the Alborz mountain range. We have a full schedule today which starts of course with tea! and then visit tea farms in Lahijan and meeting people how work on the area. Pressing onward, we reach the Iran national Tea Museum for a look at the origins of Iran tea farming and production. This morning we’ll start our day in the tea gardens plucking the tender leaves along side the expert tea pickers. Take our leaves back to the factory and see all the processing steps that turn the green leaf into our favorite brew. In the afternoon we’ll put our tongues to work in the tasting area, evaluating the day’s production. After breakfast we’ll transfer to the Rasht airport because we’re off to Tehran! Arriving in Tehran we’ll meet our guide, enjoy a delicious lunch and settle into our hotel.